Update 1: Please do not confuse Galaxy S4 screen mirroring with Android screen mirroring through Chromecast. Android screen mirroring (screen cast) is also supported on Galaxy S4. Update 2: For detailed comparison of Chromecast and Miracast, please check this guide. You may not know you can enjoy any contents in your Galaxy S4 in a bigger screen (e.g., TV). You can simply share the Galaxy S4 screen with most TVs or even some projectors. This is Galaxy S4 screen mirroring. Some geeks may call it wireless display, which is used by some other vendors. This ultimate guide of Galaxy S4 screen mirroring will solve the problem for you. Everything you need to know about Galaxy S4 screen mirroring will be covered. I will update this guide regularly. If you have any questions or suggestions, please leave them in the comments section below. What is Galaxy S4 screen mirroring? 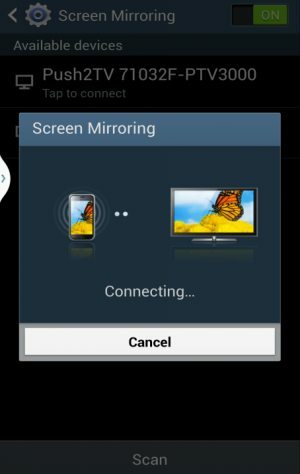 Galaxy S4 screen mirroring (or wireless display) simply duplicates the display in your Galaxy S4 on TV or other bigger screens (e.g., projectors). In other words, instead of staring at the 5″ screen, you can share Samsung Galaxy S4’s screen with TV of any size. The Samsung Galaxy S4 then works like a remote control for your TV. 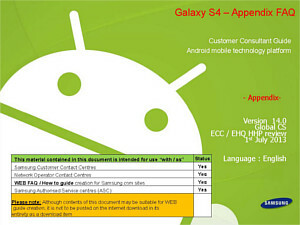 Update: Now you can read thsi Galaxy S4 FAQ guide (Galaxy S4 Customer Consultant Guide) directly in this post. Galaxy S4 is packed with so many features, therefore it is not strange that a lot of owners have some sorts of problems or questions. Although the S4 Owners Manual provides valuable guides and info, it is impossible to cover all aspects. Even some technicians in Samsung Service Centre may also have some doubts on some features and functions. So, Samsung compiled 140 FAQs for Galaxy S4 owners. The documentation is intended for staff in service centres. Actually, almost all flagship Android models have the Customer Consultant Guide. Anyway, in this guide, there are 140 questions and answers, which cover almost all S4 specific features. It is a good reading material if you are still struggling with your S4. The PDF version is provided in this post for you to download and read offline. We are also trying to make an online page for these FAQs together with the User Guide. Once this is done by the end of this month, you can read all documentations online instead of downloading PDF files. Rumors after rumors. Finally Samsung Galaxy S4 officially comes. It is proven again that the rumors are correct. 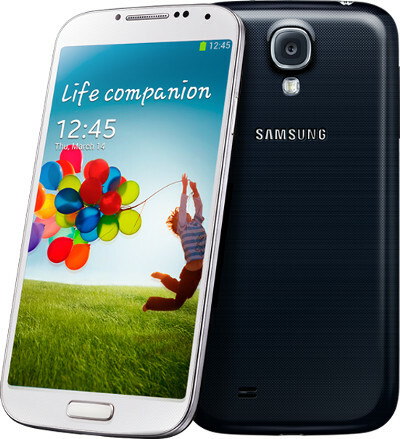 Most of the specifications are posted in our previous post on the rumored specifications of Galaxy S4. To summarize, Galaxy S4 comes with Android Jelly Bean 4.2.2 (the latest version), 5″ full HD AMOLED display, Samsung Exynos Octa CPU (or Qualcomm Snapdragon 600 for US market, here is the comparison of these two processors). 2GB RAM, 13MP/2MP camera, 2600mAH battery. The design is similar to S3 and Note 2. The weight is 130g. Plastic as usual. We will introduce some of these features in coming posts. Stay tuned! Of course, Samsung also released an official introduction video for Galaxy S4.